Toshiba announced two "enthusiast-class" laptops today, built for gaming and media creation: the Qosmio X770 and Satellite P700 series. Both series offer optional 3D models, NVIDIA discrete graphics, HD displays, and, for these specs, attractive prices starting at $1,200 for the gaming Qosmio and $630 for the Satellite P700 series. The Qosmio X770 and X770 3D are designed for large-screen gaming and multi-media consumption, with a 17.3-inch 1080p HD display and Blu-ray configuration options. According to Toshiba's press release, the Qosmio X770 is one of the first laptops to use the Nvidia GeForce GTX 560M graphics processor with 1.5GB of graphics memory. The 3D model uses NVIDIA 3D Vision technology and can output to a 3D TV. (If you haven't noticed yet, Toshiba is big on 3D. The Qosmio X770 3D doesn't do simultaneous 2D and glasses-free 3D, however, like the Qosmio T851/D8CR). The 3D version also adds a 1.25 TB hybrid hard drive and rewritable Blu-Ray, but costs $1,899.99 compared to the non-3D model's $1,199.99 price tag. Both will be available later this month with a choice of second-generation Intel Core i5 or i7 processors, up to 8GB of RAM, and red LED backlighting for the keyboard. The new Satellite P700 series come in a range of screen sizes and offers several customization options. 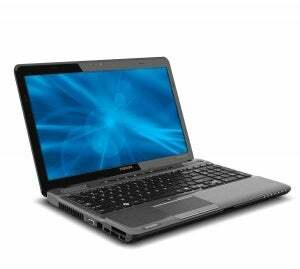 The Satellite P745, P755/P755 3D, and P775 laptops feature 14-, 15.6-, and 17.3-inch HD displays, respectively. They're available with second-generation Intel Core i3, i5, or i7 processors and NVIDIA GeForce GT 540M graphics. Or, you can choose the new AMD A6-3400M processor. The Satellite P700 series also offer multimedia features: harman/kardon speakers, an HDMI port, Intel WiDi for wirelessly connecting to a WiDi-enabled TV, and Blu-ray disc player. Storage option go up to 750GB. For a laptop with strong media features, the starting prices of $629 for the P755 and P775 or $699.99 for the P745 are pretty reasonable. If you want 3D, however, the 15.6-inch P750 3D will run you at least $1,199.99. The Satellite P700 laptops will be available starting June 21.